Clay pigeon target throwers and clay pigeons. 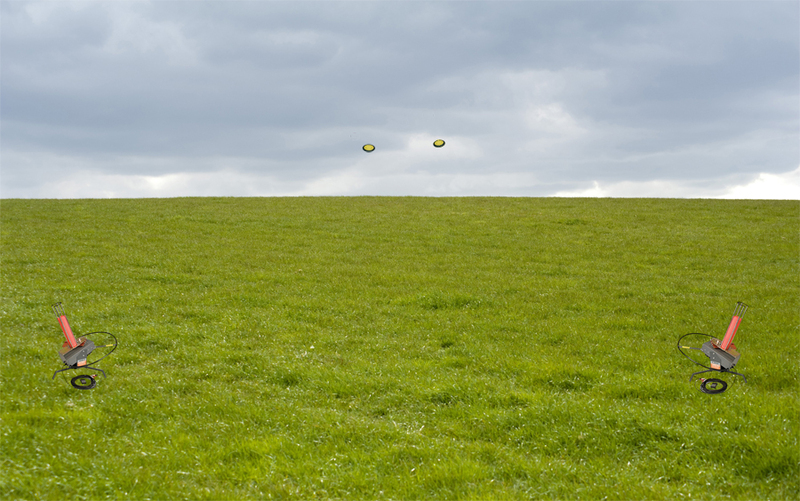 Clay pigeon target throwers, equipment used in firearm practice, engaged in a duel. The clay pigeons automatically fly with timed intervals through the air. The objective is to realize a collision. When the clay pigeons fly past each other, the image may refer to a poor sense of aim or, if you will, to a fortunate near escape. The undamaged discs accumulate on both sides of the field and will be collected for the next flight. Where the discs do collide during its short flight, the yellow black shards accumulate in the middle of the field.